Austin is about 270 miles to the Mexican border in Nuevo Laredo. Total milage from Austin to Patzcuaro is about 1000 miles. Austin has a Mexican consulate where tourist visas and auto permits can be obtained, saving a stop at the border. CAUTION! Return the permits at the border when you return to USA. We have the largest Whole Foods Store in the world along with the more popular Central Market. These are perfect places to stock-up for the drive south. 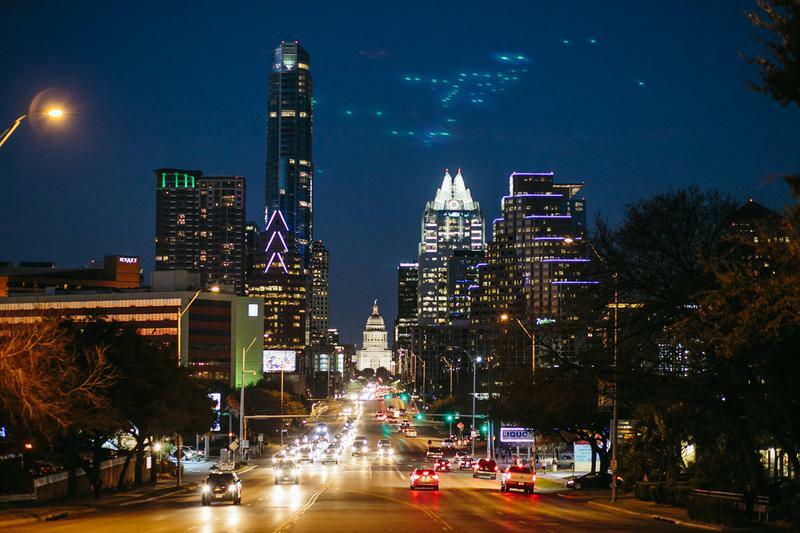 Updated news on everything in Austin! Old Post Card views of Austin! Find the best Bluebonets around a specific area! Lady Bird Lake (formerly Town Lake) is a reservoir on the Colorado River in Downtown Austin, Texas, in the United States. It was created in 1960 by the construction of Longhorn Dam and is owned and operated by the City of Austin in cooperation with the Lower Colorado River Authority. The surface area of the lake is 416 acres, and it is used primarily for flood control and recreation. Located on the lake's shoreline are various hotels and apartments, as well as the Auditorium Shores park and the Austin Hike and Bike Trail. By the 1970s, Town Lake and its shoreline had become neglected, polluted and overgrown with weeds. KTBC referred to the lake as an "eyesore." During his two terms in office (1971–75), the Mayor of Austin Roy Butler partnered with former United States First Lady Lady Bird Johnson to establish the Town Lake Beautification Committee with the purpose of transforming the Town Lake area into a usable recreation area. A system of hike and bike trails was built along the shoreline of the lake in the 1970s, establishing (what was then known as) Town Lake as a major recreational attraction for the city of Austin. On July 26, 2007, the Austin City Council passed a controversial resolution authorizing the renaming of the reservoir from Town Lake to Lady Bird Lake in honor of Lady Bird Johnson, the former First Lady of the United States and a long-time resident of the Austin area who had died earlier that month. Johnson had declined the honor of having the lake renamed for her while she was alive. In renaming the lake, the City Council recognized Johnson's dedication to beautifying the lake and her efforts to create a recreational trail system around the lake's shoreline. The sprawling capital of Texas has welcomed over 100,000 new residents since 2010. Along with all the new Austinites, dozens of new shops, restaurants, bars and hotels have appeared, turning the formerly sleepy city into a thriving metropolis quickly approaching a million inhabitants. Every March, the South by Southwest Festivals will only add to the bustle. To catch up on the cool arrivals, you’ll need a rental car or a service like Uber or Lyft, as well as the patience to brave the city’s traffic. 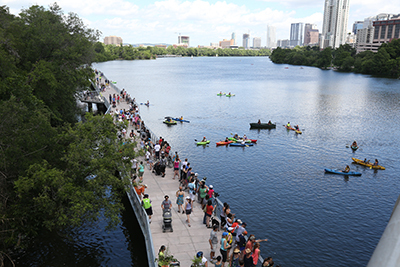 If you’re a first-time visitor, take time for the city’s must-sees, like Lady Bird Lake, the State Capitol and the enormous bat colony that lives under the Ann W. Richards Congress Avenue Bridge. With all the excitement in Austin, you might also find yourself considering moving here for good. 1. ­The New South, 4 p.m. While South Congress Avenue, a.k.a. SoCo, has been a countercultural favorite for generations, new arrivals are refreshing this colorful strip south of the Colorado River. Joining established shops like Service Menswear, the recently opened Revival Cycles stocks cool jeans from Austin’s own Traveller Denim, next to the sleek South Congress Hotel, whose lobby bar has become a destination in and of itself. Across the street, Cove offers casual women’s clothing from Mara Hoffman and other indie designers. Down the street, the well-established Stag Provisions gives its old fans a new reason to shop through its collection of heritage men’s clothing: an exclusive collaboration with boot maker Red Wing, finished in the same rough-out Mohave leather used by the United States Marine Corps ($260). 2. ­French Fare, 8 p.m.
With a name like Hopfields, it might sound like this place is all about the suds, but locals love this central Austin gastropub for such French-inspired fare as steak frites with Dijon mustard, house-made pâtés, and the Pascal burger (with Camembert, cornichons, whole grain mustard and caramelized onions), which many call the city’s best. At just over four years old, Hopfields is nearly a veteran now, but keep an ear out: Rumors of a coming second location abound. 3. ­Fowl Play, 9:30 p.m. Betting on its hometown’s claim as the Live Music Capital of the World, Geraldine’s — the stunning fourth-floor bar and restaurant inside the new Hotel Van Zandt — offers live concerts 365 days a year. (Geraldine’s is named after a neighborhood guinea fowl, who moved on to the great farmyard in the sky after being hit by a car in 2014.) Geraldine’s offers killer views of the downtown skyline, as well as up-close views of musicians performing everything from modern indie-rock to traditional blues and country. 4. ­Historic Homes, 11 p.m. Check out the numerous watering holes on nearby Rainey Street, like 2014’s Container Bar, built out of shipping containers. Many popular Austin destinations were constructed inside Rainey’s historic bungalows, like Javelina, a friendly roadhouse with communal tables and outdoor seats that face the evening parade. 5. ­Java Upgrade, 10 a.m.
Austin’s burgeoning barista scene offers plenty of options for a morning pick-me-up, from old favorites like the original location of Caffé Medici on West Lynn Street to newer spots like Radio. Before you explore the shops and restaurants in the South Lamar neighborhood, start at Picnik, a coffee trailer that serves high-grade java, including upgraded options with grass-fed butter and medium-chain triglyceride oil. The pastry case includes Paleo-inspired treats — that morning poppy seed muffin might be delicious, but it’s also gluten-free, grain-free and free of refined sugar. 7. ­Instruments to Go, 2 p.m.
Take inspiration from local musical talent and shop for instruments as souvenirs. 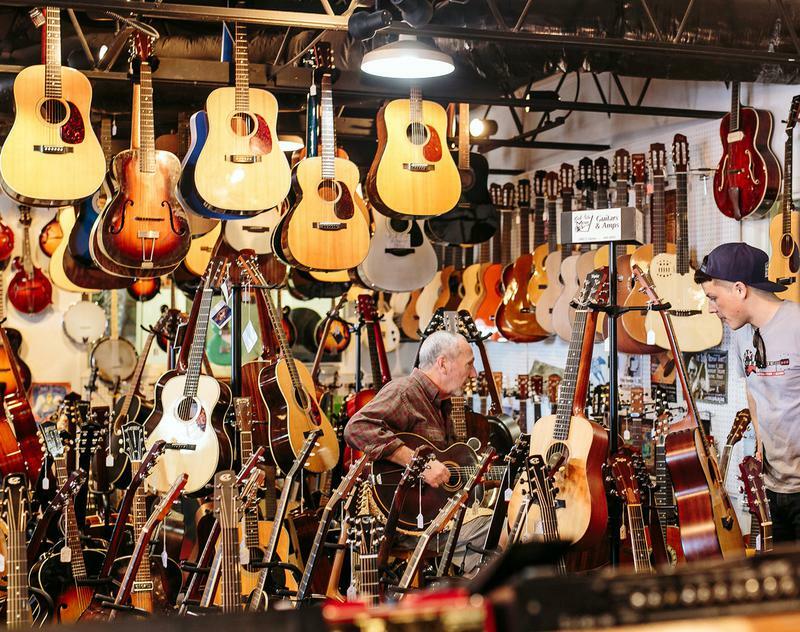 From South Lamar, start out at South Austin Music, a favorite for electric guitars and effects, then head north across the river to Hill Country Guitars, where a gorgeous, Sitka-topped acoustic from the local luthier Collings Guitars will set you back a cool $4,568. A bit farther north, Austin Vintage Guitars offers collectible models from brands like Fender, Gibson, Rickenbacker and Danelectro, as well as guitar picks, slides and T-shirts in a spacious new shop. ­8. New ’Cue, 3 p.m. In the old days, lovers of great barbecue knew to leave Austin for smoke pits in nearby towns like Lockhart and Driftwood. Then came East Austin’s Franklin Barbecue in 2009, frequently called the best in the country. 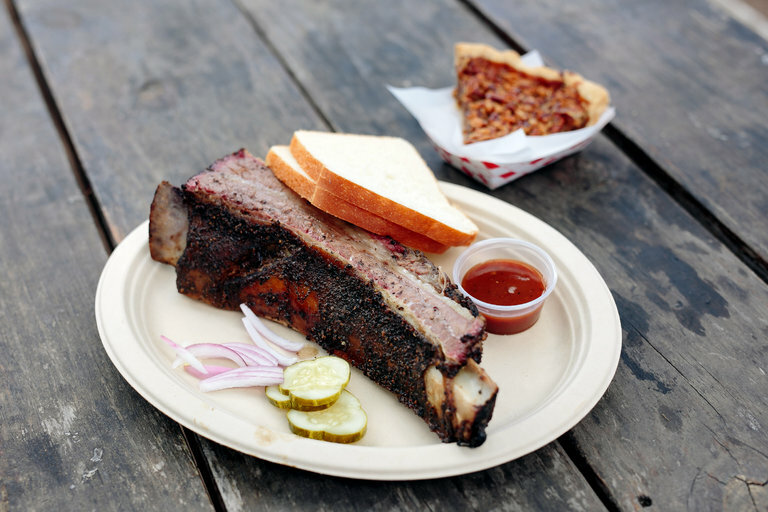 With the line often stretching for hours, you can get a quicker snack at Micklethwait Craft Meats, which serves fall-apart smoked brisket, massive beef ribs and flavorful specialty sausages. (The backyard party vibe is another draw.) Afterward, clear the smoke from your palate with a tasting tour at Blue Owl, a brewery specializing in sour ales. 9. ­Art Hungry, 4 p.m.
Last November’s East Austin Studio Tour included more than 280 artists’ studios — and that was just in rapidly gentrifying East Austin. Catch up on the area’s colorful new venues like Wade ArtRoom, an intimate gallery run by the painter Angela Mathias, or stop by East Austin’s long-running Pump Project, a warehouse studio space featuring some 35 artists, which was joined by the new Icosa Collective, a group of 20 visual artists, last year. Then cross Interstate 35 into downtown Austin, home to the Jones Center, which merged with the beautiful villa and sculpture park out at Laguna Gloria to form a museum called the Contemporary Austin in 2013. The current exhibition, “Mark Mothersbaugh: Myopia,” a solo show from the co-founder of the band Devo, runs through April 17. 10. My Beautiful Laundromat, 7 p.m. Many of the city’s coolest restaurants — places like Wu Chow, Bullfight and Geraldine’s — are less than a year old. Among the best new arrivals is Launderette, where Rene Ortiz extends contemporary Mediterranean cuisine to include influences from regions like North Africa and the Levant: rich beet hummus and crisp flatbreads accompany a creamy labneh appetizer, spicy Aleppo prawns get an aromatic dose of mint, and the juicy house burger arrives on a fluffy challah bun from the acclaimed pastry chef Laura Sawicki. 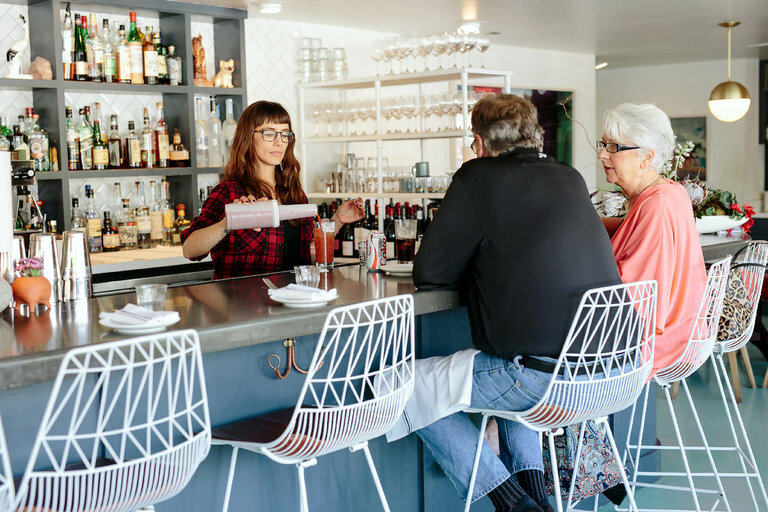 Launderette’s front of the house can’t always keep up with the kitchen, but the excellent cooking and fun-loving crowd in this former laundromat make up for the kitsch soundtrack and hit-or-miss service. 11. ­Craft Cocktails, 10 p.m. Check out the expanding bar scene in downtown’s Warehouse District, surrounding Republic Square, with a sampling of craft cocktails at the new Roosevelt Room, which lists its mixed drinks by era of origin, from classic “early years” concoctions like the Brandy Crusta (Cognac, orange liqueur, fresh lemon juice, bitters) through Prohibition-era favorites like the Blood & Sand (Scotch, orange juice, sweet vermouth, Cherry Heering). Intimate booths and videos projected on the wall give an underground character to the long, dark space. Afterward, see how the newcomer compares with an old favorite like Péché, just two blocks away, where the focus is on high-grade absinthes like Switzerland’s exceptional Clandestine. 12. ­Taco BBQ, 11 a.m.
There’s no better morning-after restorative than Valentina’s, which combines classic Texas barbecue with authentic Mexican fare. Fans followed this food trailer’s move from downtown to a parking lot in South Austin, lining up for potato-egg-and-cheese breakfast tacos with house-made chorizo ($3), as well as lunch tacos like the smoked-brisket taco, topped with guacamole and a mild tomato-serrano salsa ($5), and the pulled “pollo” chicken taco, dressed with spicy tomatillo-habanero sauce ($4). There are many reasons to head to Hill Country, the undulating landscape that starts just outside Austin, but for beer fans, ground zero is Jester King: Set on a working ranch, this brewery and beer garden is the No. 1 Austin destination for users of Ratebeer.com. After sampling rare drafts like El Cedro, a cedar-aged farmhouse ale, direct your designated driver to Revolution Spirits, a distillery that makes raspberry, apricot and cherry liqueurs with fruit pulp left over from Jester King’s brews, as well as Austin Reserve, a richly aromatic gin. Then walk across the parking lot to Last Stand, a new microbrewery, where you can sip a pint of bittersweet coffee porter while enjoying a classic Texas pastime: a game of chicken-poop bingo. The new South Congress Hotel (1603 South Congress Avenue; southcongresshotel.com) has an enviable location on one of the city’s coolest shopping strips, as well as a rooftop pool and popular lobby bar. A web search for April found double rooms starting around $255. Just off the trendy Rainey night-life scene, Hotel Van Zandt (605 Davis Street; hotelvanzandt.com) has 319 well-appointed rooms and an enviable bar, restaurant and live-music venue in downtown Austin. A web search for February found double rooms starting at $249.